It was on one of the hottest days of the summer that I communicated with Blazey, a 15-year-old dark bay quarter horse with whom I've had the pleasure of conducting remote conversations before. While we talked, Blazey wandered aimlessly around his paddock in Rhode Island, while I sweltered in front of a fan in my office, an hour away. Telepathy fueled our connection. Blazey was chatting amiably about his accommodations, freely sharing his opinions about the quality of his hay, the cleanliness of his water buckets, and the neatness of his stall. He doesn't hold back his assessments, and though we've never met, I've long been enamored with Blazey's facility at long-distance communication. Our last session had occurred more than a year ago, when his person, Joan, had asked me to tune into him because he'd been injured. I didn't know how, when, or why, but those details turned out not to matter, because Blazey promptly let me know that something terrible had happened to his left front foot. He reeled off what looked like a show-motion movie, in which I could see that he had torn off a shoe while he was running in his paddock, and as a result, his foot was being soaked, and had been wrapped in some type of boot. He showed me that he'd been confined to his stall, with hand-walking his only exercise. It turned out that not only had Blazey's shoe been sheared off in the incident, but with it, a weighty chunk of his left front hoof. His injury was quite serious and it was only through the intervention of a team of expert equine veterinarians that he made a miraculous recovery. Equally miraculous was the accuracy with which Blazey had conveyed to me the particulars of his accident and his daily aftercare, down to the smallest specific of his rehabilitation regimen. And so I was a bit puzzled this time, when, as part of our exchange of thoughts and feelings, Blazey showed me what seemed to be a picture of popsicles. I assumed that perhaps he'd seen barn people taking frosty bites of the colored ices-on-a-stick, but wasn't quite sure why they would have made such an impression on him. 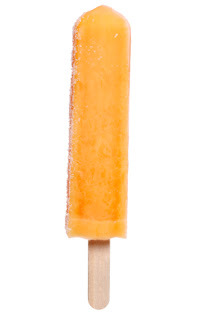 When I shared the popsicle puzzle with Joan, she laughed, confessing that she regularly brings Blazey a special summer treat, in the form of frozen carrots. Of course! They look a lot like popsicles, sans the sticks! My trust in Blazey's telepathic abilities was renewed. Like so many horses, he's consistently been able to communicate by telegraphing vivid color pictures of the world around him. We can all learn to "see" what they are saying, simply by closing our eyes.